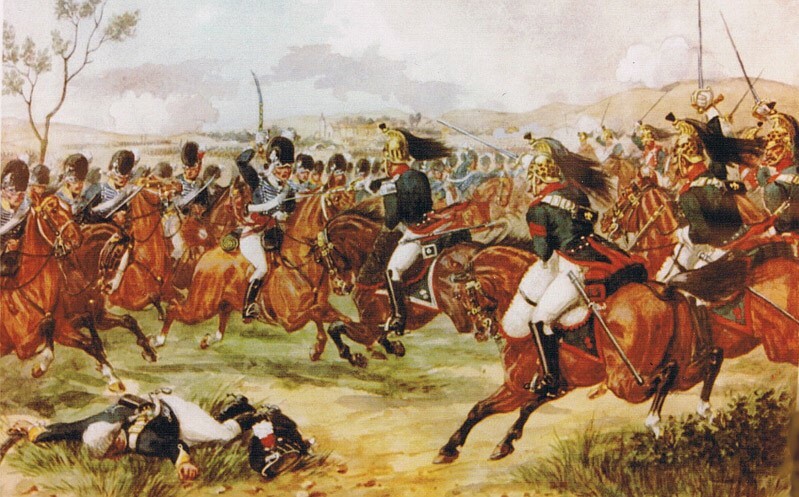 The Battle of Vimeiro took place on this day in 1808 when the British under General Sir Arthur Wellesley defeated the French under Major-General Junot near the village of Vimeiro in Portugal. Four days earlier, Wellesley had defeated the French at the Battle of Rolica. Wellesley knew that his command of the army was temporary; he was seen as too junior a general to have overall command and he had been informed that more senior commanders were on their way. Sir Harry Burrard arrived during the battle and Sir Hew Dalrymple arrived soon after while Sir John Moore landed in time to take command of the British forces and lead them into Spain. Nevertheless it was Wellesley who was in command when the army was attacked by Junot After Rolica, Wellesley had taken up a position near the village of Vimeiro, deploying his forces to hold the village and several ridges to the west which protected the landing point at Maceira Bay. Wellesley had hoped to march on Lisbon once his reinforcements had landed. He had eight infantry brigades, around two hundred and forty light cavalry and two thousand Portuguese troops, outnumbering Junot by around six thousand men. Junot’s first move was to attempt to outflank the British by taking an unoccupied ridge to the north-east of the village. Wellesley’s men held Vimeiro and the western ridge, but he moved quickly to take the ridge ahead of Junot. Junot sent reinforcements to join the battle on the flank but made the decision to launch an attack on the village without waiting to see the outcome of his outflanking manoeuvre. The first attack was made by Thomieres brigade who marched on the British position in column, with skirmishers and artillery in support. 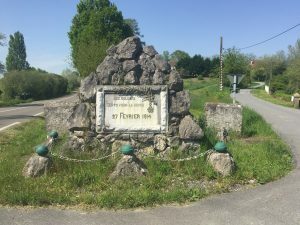 The British countered with four companies of riflemen from the 60th and 95th and their attack was so successful that the French skirmishers were pushed back, leaving the main French column facing the 50th regiment. At 100 yards the British opened fire while several companies began moving in towards the French flanks. The French reeled under the lethal musketry of the British infantry and were unable to deploy into line. They fled, leaving three cannons to be captured. Shortly afterwards, Charlot’s brigade attacked Anstruther’s brigade which was hidden behind a crest and before they could deploy from column into line were struck in the flank by a second battalion which sent them fleeing in disorder from the deadly volleys. Junot sent in his grenadier reserve which was initially pushed back. Two battalions to the right managed to enter Vimeiro but were driven out by a British counterattack and then routed in flight by the light dragoons. The cavalry appear to have become carried away by their success and charged out of control, straight into the French cavalry division. 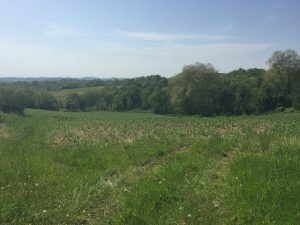 They retreated to the loss of Colonel Taylor and approximately a quarter of his men. Solignac led the French attack on the northeastern ridge, this time in a three column formation. Once again they left it too late to deploy into line and were shattered by British musket volleys and fled. 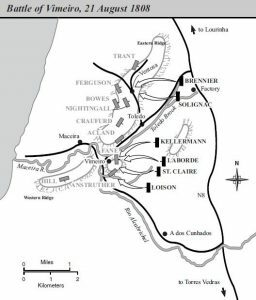 Brenier’s brigade, coming up with four battalions, had some success against two British battalions who appeared unprepared after their success against Solignac. 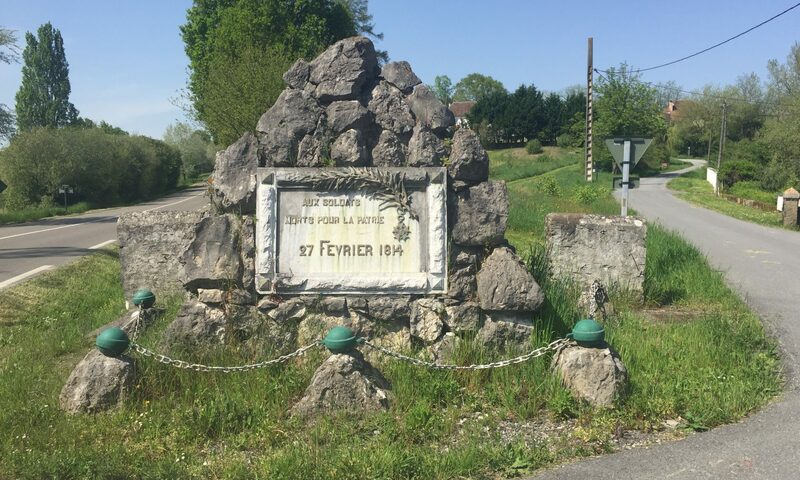 However the French were stopped by the firepower of the 29th and the two remaining battalions rallied to join them in pushing Brenier’s men back. 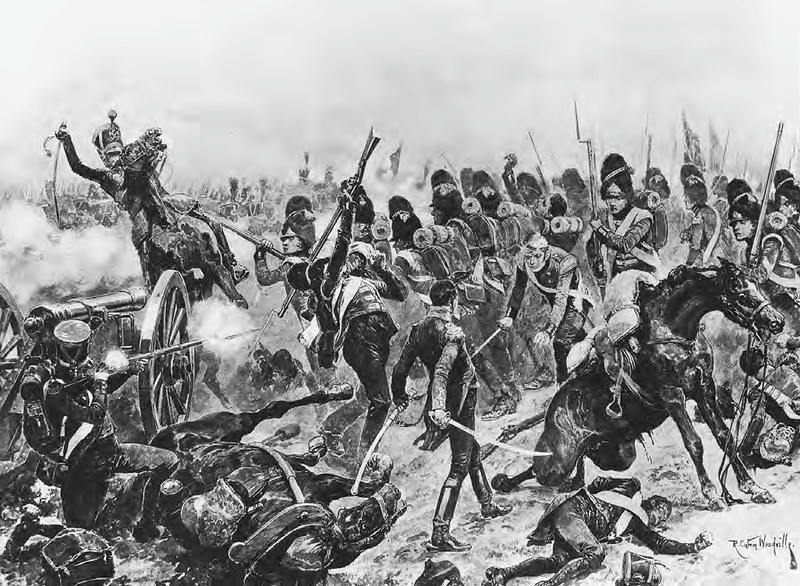 By the end of the battle, Sir Arthur Wellesley’s command had been superseded by Sir Harry Burrard. Burrard did not interfere with Wellesley’s conduct of the battle, but once it was done, he stepped in to prevent Wellesley pursuing the French retreat, apparently believing that Junot had troops in reserve. Vimeiro was a welcome triumph for the British but the aftermath was a disaster. Junot offered complete surrender and was probably astonished at the terms offered by Sir Hew Dalrymple. Under the Convention of Cintra, the defeated army was transported back to France by the British navy, complete with guns, equipment and the loot it had stolen from Portugal. The Convention caused an outcry in Britain and all three generals were recalled to face an official enquiry. Wellesley had wanted to fight on. He had signed the preliminary Armistice under orders but took no part in negotiating the Convention and did not sign it. Dalrymple appeared keen to lay the blame onto Wellesley but at the enquiry, which was held in the Great Hall at the Royal Hospital, Chelsea in November and December of 1808 all three generals were officially cleared. Wellesley, however, was returned to duty in Portugal where the British had suffered the loss of Sir John Moore at Corunna; neither Burrard or Dalrymple were given active commands again. The battle of Vimeiro gave hope to the people of Lisbon and should have been a sharp reminder to the French that they were not invincible. Wellesley, up until this point, had been known mainly for his achievements in India and some years later Napoleon was to use the term “sepoy general” to belittle the importance of that experience. Rolica and Vimeiro, however, brought Wellesley very firmly onto the European stage and when the dust from the convention of Cintra had settled, Sir John Moore was dead and Burrard and Dalrymple were no longer considered suitable for command. The sepoy general was given his opportunity and on his return to Portugal in 1809 he was quick to prove himself worthy of it with a swift and decisive victory at Oporto. In the Peninsular War saga, Paul van Daan is present at the battle of Vimeiro but the battle itself does not feature in An Unconventional Officer; if I’d included every battle in depth it would have been longer than the Bible. It’s an interesting battle, though, with a lot of features which have become very familiar to me as I follow Wellesley and his army through the long years of the war in Portugal and Spain. Reading about it once again on the anniversary, I find myself wondering if this early time in Portugal is something I’d like to revisit at a later stage. The next book in the Peninsular War Saga is due for publication on 30th November 2018. It will be followed by the second book in the Manxman series the following year, which follows Captain Hugh Kelly RN through the Walcheren campaign of 1809. 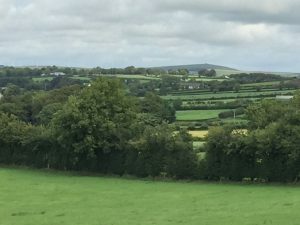 I’m currently on a week long trip to Northern Ireland: a place of contrasts which leaves the traveller in me overwhelmed by the beauty of the landscape and the historian in me with her head spinning. After only a few days it’s clear to me how appallingly difficult it must be for any historian writing about the turbulent past of this area to find a balance between the stories of the past and the ongoing narrative of the present. I’ve never studied the history of Ireland in any depth. During my younger years at school, Ireland tended to be taught as a footnote to the political situation in England at the time. I learned about Catholic emancipation, Daniel O’Connell, the Phoenix Park murders and Charles Stewart Parnell without ever really going into their significance within Ireland. Later, as an adult, I read more widely, inspired by the novels of Leon Uris, Trinity and Redemption. I learned something of the Civil War horrors while at University. But all of these have come in snatches, bits of information read and stored away, without ever finding time to read around the subject and develop an overview. This trip has changed that for me. 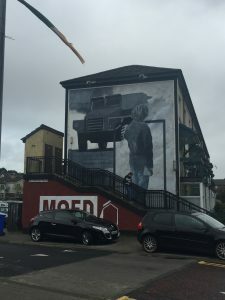 Spending time in Belfast and Derry, reading accounts of the confusing relationships between the English, the Scots and the Irish of all persuasions has reminded me that through the centuries this has been so much more than the simplistic explanation of conflict between Protestants and Catholics which was what I remember being told as a child, watching the violence explode across the evening news week after week through the seventies. IRA bombings were a reality of life, coming close to home on more than one occasion, and all I can remember back then was a sense of anger at feeling under threat over a cause that I did not understand and felt was none of my business. I’ve travelled to Ireland many times since then both on holiday and as the former owner of a Manx Irish dance school. I’ve made friends and grown to love the place but most of my trips have been to the south where the sense of history is just as strong but very different. Here in the north, the feeling of the past whispering in the ear of the present is far stronger. 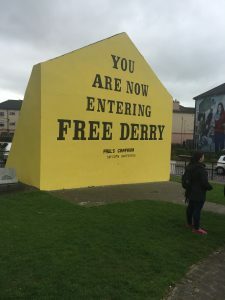 Yesterday we went for a trip to Derry / Londonderry and visited the Free Derry Museum and the Siege Museum; history through different lenses. Even the fact that I’m not sure which name to call it is an indication of the complexity of dealing with the history of this region. It would not occur to me to write Banjul / Bathurst or Zimbabwe / Rhodesia or Thailand / Siam in a blog post, but the difference in the name given to the walled city is more than a matter of history here, it’s a statement of allegiance. In my own writing so far, the turbulent history of Ireland is a back story that I’ve not explored, but being here, it’s a back story that I can see coming to the fore at some point. Michael O’Reilly is a central character in the Peninsular War saga and it has occurred to me more than once that his history as an Irish rebel and fugitive from justice must be in direct conflict to the bonds of friendship he comes to feel for the Englishmen he fights alongside through the long years of the war. I’d like to know more about the young Michael and how he ended up where he did. 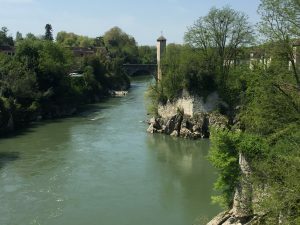 Alongside the historical complexity of this region is the stunning beauty of the scenery and that can be appreciated without needing to understand any more. Coming from the Isle of Man, I consider myself a connoisseur of fabulous coastlines and this one is definitely up there with the best. 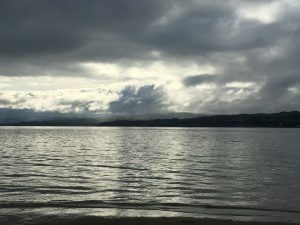 Travelling back on the Lough Foyle ferry yesterday evening into Magilligan was magical. I love Northern Ireland and will definitely be back. Before I do, I’d like to have read a lot more about the history and feel more at home with the events and the people that have shaped this place. But even for the casual holidaymaker in search of beauty and peace and incredibly friendly people, I would highly recommend it. It had been hot for two weeks, a blistering heat which had battered down on the Anglo-Portuguese army as they sat on the edge of the city of Salamanca, setting up a ferocious artillery fire which was designed to pound the city, a major French supply depot, into submission. The French had converted four convents into temporary fortresses and had settled initially to wait for reinforcements. Lord Wellington’s guns were neither numerous enough or powerful enough to subdue the fortifications, but he had more than enough men to blockade the city and with no reinforcements forthcoming, the French had surrendered. Wheeler broke into laughter as a pretty brown haired woman in a sprigged muslin gown sped past them carrying a fetching straw hat trimmed with silk flowers. “Get a move on, Teresa, we’re dying of heat stroke out here,” he called. Teresa Carter looked back over her shoulder, laughing. 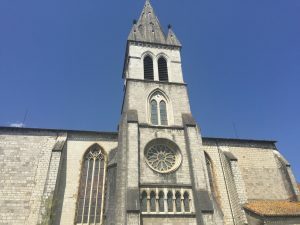 “I do not know why he bothers, she will have lost it before they get into the Cathedral,” she said. At the head of the 110th, Colonel Paul van Daan took the hat from Teresa with a smile of thanks and turned to his wife. Paul’s orderly grinned and spurred his horse forward. Much of the army was settled in sprawling cantonments on the edge of Salamanca, but several regiments had been selected to form part of the parade into the city. This would lead to a Te Deum in the Cathedral and the Plaza Mayor would be illuminated during the evening while Lord Wellington and his officers were entertained by the Spanish grandees of the city to a civic banquet and fireworks. 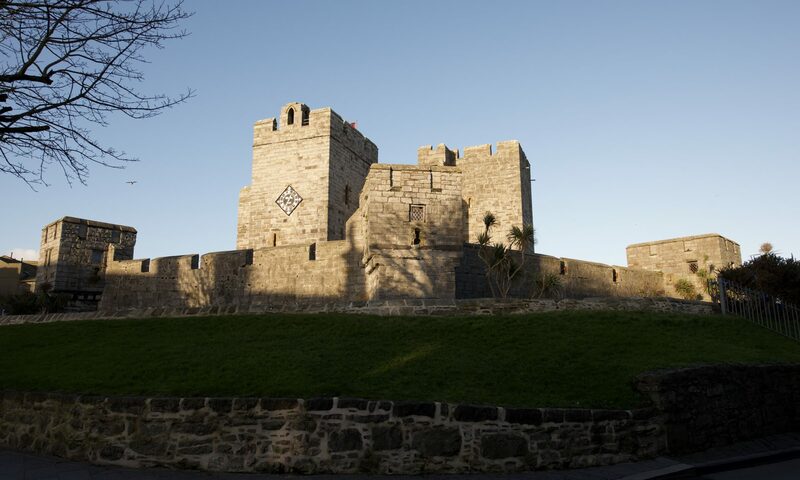 What better way to spend a beautiful evening than to take a tour of haunted Castletown? That’s how I spent yesterday evening, courtesy of Isle of Man Ghost Tours, and I have to say I thoroughly enjoyed it. I’ve done a few ghost walks in the UK over the years. The York one was particularly good and I also enjoyed Chester and Shrewsbury. A few years ago a friend invited me to join her work evening out which turned out to be a ghost walk around Douglas followed by a meal and drinks. It was winter, a freezing cold evening and I think the early darkness contributed to the atmosphere although by the end I suspect we were all too cold to enjoy the final few stories. It was a different experience yesterday and we toured Castletown in the evening sun. 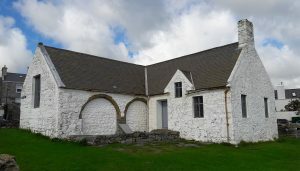 It was a very small group; the walks have only just started up again for the summer season and it was Tynwald Day, a bank holiday on the Isle of Man, so I suspect a lot of local people were at St John’s or else at home enjoying the weather. My own family chickened out so I went alone. The appeal of a ghost tour for me is only partly about the supernatural. I’m not really a believer in ghosts but I have always loved a good ghost story. As a child I was very susceptible to nightmares and I can remember my mother banning me from taking books of ghost stories from the library as she was fed up with being woken up in the night by an eight year old hearing imaginary bumps in the night. As an adult I still enjoy them and was a huge fan of the novels of the late, great Barbara Mertz who wrote some fantastic ghost stories under the pen name of Barbara Michaels. But in addition to the supernatural element, I just like a good story, and that is what I got from the tour last night. The guide interspersed tales of hauntings and mysterious figures with comic anecdotes about such local characters as Gerald Gardner, the founder of the Wicca movement, who lived in Castletown and apparently had to be warned by the local constabulary for holding meetings in his home which included a collection of naked women. Gardner was obliged to get curtains put up to avoid offending the neighbours and to get rid of the horde of peeping Toms who used to hang around in the street outside. Other stories genuinely had a spooky feel about them. The ghostly woman in black seen around Castle Rushen is a very traditional ghost story but there’s a reason it’s a classic and the mysterious light coming on at night in one of the rooms of Compton House was also an odd one. I also enjoyed the haunting of the Old Grammar School; ghostly children’s voices singing in an empty building is a definite chiller. I was curious to find out if there were any ghosts from the Napoleonic War period but there were none mentioned on this tour. 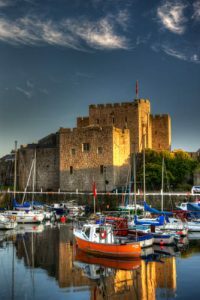 A lot of the Manx chapters of An Unwilling Alliance are set in and around Castletown and it would be fun to come up with a story from that period. I’m currently looking out for an idea for a nice Manx ghost story for Hop tu Naa this year, so watch this space. All in all, I’d really recommend this as a way to spend an evening. I’d like to go back to do some of the other tours as well; I’ve a feeling there are many more spooky tales to come. Sir Home Riggs Popham, who features in my recent book, An Unwilling Alliance, is one of the most fascinating characters I’ve read about during my research and I am completely unable to make up my mind how I feel about him. As a novelist rather than a historian, I need to be able to present a historical figure in a way that is believable and fits in with the perspective of my fictional characters, but in the case of Popham I find my heroes as ambivalent as I am. Popham had a wide and varied career and was the subject of much controversy during his lifetime. He was the subject of one court martial and several different investigations, none of which seemed to hold back his career to any great degree. He was a naval officer who seemed more comfortable with the army and was both admired and disliked by contemporaries. The Duke of York applauded his ability while Lord St Vincent seems to have loathed him. He was ambitious, talented and clearly very intelligent but seems to have had the kind of personality that made enemies as easily as friends. Popham was born in Gibraltar in 1762 to Joseph Popham, consul at Tetuan. His mother died giving birth to him and his father later remarried. Between his two wives, Joseph Popham had a large number of children; sources seem to vary as to the number. Home Riggs Popham was educated at Brentford School and then at Westminster and may have been admitted to Trinity College, Cambridge, although it is not clear how much time he actually spent there. In 1778 at the age of 16 he entered the navy as a captain’s servant on board the Hyaena. Popham’s early career in the navy was fairly typical. He was involved in a number of skirmishes and spent a few months as a prisoner of the French in 1781. He was promoted to lieutenant in 1783. Aboard the Nautilus in 1786 he was responsible for surveying the coast of south-west Africa, building a reputation as an excellent hydrographer. Progress in the navy was often slow. There were more officers than good commands and many excellent men were unemployed and on half-pay awaiting a ship, including Popham in 1787. Obtaining leave from the Admiralty, he bought his first ship and sailed for India as a trader. He operated to and from India for several years, marrying the daughter of an East India Company officer, Elizabeth Prince, in 1788. During these years he continued with his surveying work, later publishing A Description of Prince of Wales Island with charts. He also discovered a new channel between the island and the mainland through which, in the spring of 1792, he piloted the company’s fleet to China and he was presented with a gold cup by the governor-general in council, who also strongly commended him both to the directors and the Admiralty. Popham’s commercial activities, however, were causing some suspicion and in 1791 his ship was seized by an English frigate as a prize of war, brought into the Thames, and condemned as a droit of Admiralty for having traded in contravention of the East India Company’s charter. The case was far from clear and Popham appealed, eventually receiving £25,000 over a period of time, which left him with considerable losses. There were rumours that he had been smuggling. He had also failed to renew his leave and was consequently temporarily struck off the lieutenants’ list although he was reinstated in 1793. In September of that year, Popham was appointed agent for transports at Ostend for the campaign in Flanders under the Duke of York. It was a job to which he was ideally suited, with his excellent organisational skills and understanding of logistics. He formed a corps of sea fencibles to defend Nieuport and distinguished himself to such a degree that on 27 July 1794 the Duke of York requested of the Admiralty that he be appointed superintendent of inland navigation and promoted to commander, an honour which earned him the nickname of ‘The Duke of York’s admiral’. When the Allied forces retreated in 1795, Popham was in charge of the evacuation and proved himself so competent that in March of that year the Duke wrote to the First Lord requesting that Popham be promoted to the rank of post captain. It is very likely that this rapid promotion at the request of the army engendered some resentment among Popham’s naval colleagues. During the invasion threat of 1798, Popham set up and commanded a district of sea fencibles. In May he submitted a plan for destroying the Saas lock at Ostend and was given, command of the expedition. The lock was destroyed, but because of worsening weather, the troops under Major-General Eyre Coote could not be re-embarked, and were obliged to surrender. The following year, Popham was sent to St Petersburg to attempt to persuade Tsar Paul to provide troops for a proposed landing in the Netherlands. He took the tsar and his family sailing which they apparently enjoyed so much that they presented Popham with a gold snuff-box and a diamond ring, and the tsar made him a knight of Malta. Popham secured the force needed and returned to England. Later that year Popham was once again involved in inland navigation as an allied force under General Sir Ralph Abercromby landed on the Helder peninsula. It was poorly supported by the 10,000 Russian soldiers sent by the tsar and the campaign ended with another evacuation which Popham managed with his usual flair. He was awarded a pension of £500 a year and send back to Russia to try to mollify the tsar although Paul, furious at the failure of the campaign, refused to see him. Back at sea, Popham began working on another project; the signalling system for which he is perhaps best known. His Telegraphic Signals, or Marine Vocabulary, provided ships with a flag system containing letters, words, and common phrases and enabled captains to communicate effectively. Popham’s code, was used by Nelson and his frigates at Trafalgar. It did not immediately supplant the official Signal Book for the Ships of War but was used to supplement it. Popham continued to improve the code over the next twelve years and it was widely used, finally being officially accepted by the Admiralty in 1812. At the end of 1800 Popham commanded a troop ship with Abercromby’s army invading Egypt. Once there, he was commissioned by a secret committee of the East India Company to negotiate trade treaties with the sheriff of Mecca and other Arabian states as ambassador directly responsible to the governor-general of Bengal, Lord Wellesley. Popham was successful only with the Sultan of Aden. In addition he continued his surveying work, later publishing an excellent chart of the Red Sea. On his return to England in1803 Popham found himself at the centre of another controversy, accused of having incurred ‘enormous and extraordinary’ expenses on repairs to his ship, the Romney in Calcutta. A series of investigations followed, during which Popham published A concise statement of facts relative to the treatment experienced by Sir Home Popham since his return from the Red Sea to rebut the charges. It appears that the case may have been fabricated by Lord St Vincent’s secretary, Benjamin Tucker, in the hope of currying favour and trading on the First Lord’s well-known dislike of Popham. The matter finally went to a select committee of the House of Commons which reported that the figures had been grossly exaggerated and Popham was innocent. Popham had political ambitions and hoped to become a lord of the Admiralty. He served as a Pittite MP in several different constituencies between 1804 and 1812 and some of his naval appointments were undoubtedly the result of political favour. With his wide variety of interests, Popham became interested in the invention of ‘submarine bombs’ which proved unsuccessful in practical use. He also took an interest in the idea of attacking the Spanish colonies in South America, an idea which had been debated for some years, and in 1804 submitted a paper on the subject to William Pitt, after meeting the Venezuelan patriot, Francisco Miranda. At the end of 1804 Popham was appointed to the Diadem and in August 1805 he sailed as commodore and commander-in-chief of an expedition to the Cape of Good Hope with a force under General Sir David Baird. The operation was a great success, with Popham leading his marine battalion during the attack, and the Dutch surrendered the colony. The squadron remained in Table Bay to guard against a possible French attack. At this point, Popham conceived the idea of making an attack on the River Plate. Presumably he assumed that with the Tories, led by William Pitt, his patron, in power, he could expect tacit approval, particularly if he were successful. Reluctantly Baird allowed him to take 1200 men; the squadron sailed and at St Helena, Popham ‘borrowed’ a further 180 men. There he heard that Pitt was dead, but not who had replaced him. On 25 June 1806 the small force under the command of Brigadier-General William Carr Beresford landed near Buenos Aires. With the addition of the marine battalion it totalled 1635 men. The Spanish were surprised and there was very little immediate resistance. The city surrendered on 2 July and Beresford took possession. Popham sent an enthusiastic open letter to the merchants of England announcing this lucrative new market for their goods. He had spoken too soon, however. By 10 August a force of 2000 Spaniards entered the city, overran Beresford’s men and took them prisoner. Popham and his squadron could do nothing but blockade the river and wait for reinforcements. On 3 December, with reinforcements arriving, Rear-Admiral Charles Stirling arrived to with orders for Popham to return to England. On his arrival on 20 February 1807 he was put under open arrest to await court martial on two charges: of having withdrawn his squadron from the Cape without orders; and of having launched his Argentine enterprise ‘without direction or authority’. Typically for Popham, this incident received a mixed reception. In Argentina, Popham is often seen as the catalyst of the independence which followed the invasion. 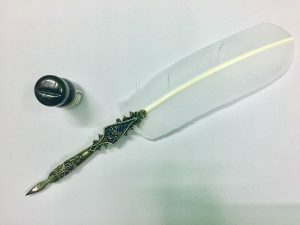 To the Admiralty he was an officer who had acted improperly; to the City of London he had made a bold attempt to open up new markets, and he was presented with a sword of honour. He was tried at Portsmouth in March 1807, was found guilty and severely reprimanded. Surprisingly, Popham’s career does not seem to have suffered from this. 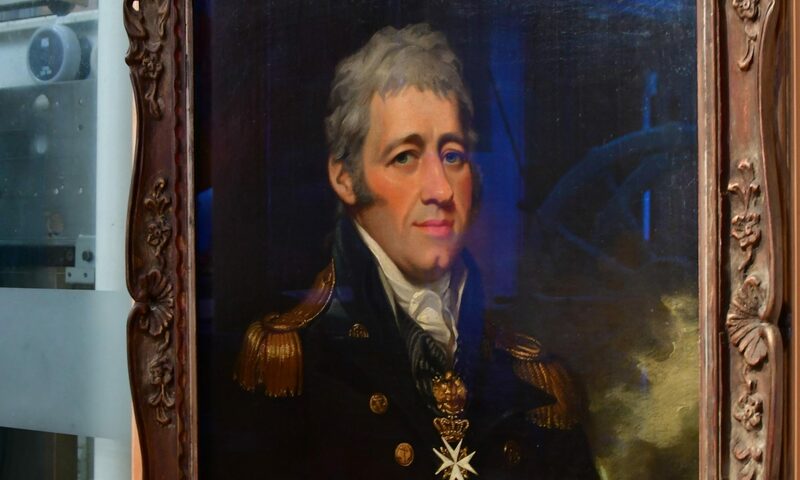 In July he was appointed captain of the fleet with Admiral James Gambier in the expedition against Denmark, and this is where we meet him in An Unwilling Alliance. Several other captains, including Hood, Keats and Stopford apparently protested at this appointment although it was probably Popham’s experience in joint operations which caused Gambier to ask for his appointment. Popham was one of the three officers appointed to negotiate with Denmark at the end of the bombardment, along with Wellesley and Murray. Popham’s next command was of the 74 gun Venerable during the disastrous Walcheren campaign. Popham’s role in this particular fiasco was interesting, since he seems to have been heavily involved in the planning of the expedition. The blame for the failure of the campaign, which should probably have been shared between the army, the navy, the planners in London and sheer bad luck landed squarely on the shoulders of the army commander Lord Chatham even though the enquiry officially exonerated him, but there may well have been some issues with the planning of the expedition from the start. Dr Jacqueline Reiter, who has written a biography of Lord Chatham, points out in this post that although there was inevitable recrimination between the army and the navy after the campaign, Lord Chatham seemed to consider the Admiralty planning of the expedition responsible for the disaster, something with which Popham was undoubtedly involved. Whatever the truth of the Walcheren fiasco, Lord Chatham’s active military career was over while Popham, still in command of the Venerable, was sent to northern Spain to assess possibilities for co-operating with the guerrillas and conducting a kind of naval guerrilla warfare against the French in support of Wellington. He was highly successful at this, keeping an entire French army ‘distracted’, and capturing Santander. Popham seems to have received very little recognition for this achievement much to his disappointment. There is speculation that his controversial career had finally caught up with him. At the end of the war he was promoted to rear-admiral and made KCB but he was not employed on active service again. He seems to have lost whatever political influence he had once had and had made too many enemies during his colourful career. From 1817 to 1820 he was commander-in-chief in Jamaica. They were not good years for Popham. He suffered badly from yellow fever and lost one of his daughters to the illness. His son, Home, also died of some kind of pulmonary illness. In 1818 Popham was made KCH but his health was failing. In June 1820 he suffered a series of strokes and wrote to the Admiralty asking to be relieved of his command. Sir Home Riggs Popham and his wife sailed for England on 15 June. They arrived at the end of July and on 11 September, at Cheltenham, Popham died of a third stroke at the age of only 58. He was buried in the churchyard of St Michael and All Angels at Sunninghill in Berkshire, close to his home, Titness Park. His wife died in Bath, aged ninety-four in 1866. They were considered to be a devoted couple. The brief sketch I have drawn of Popham in An Unwilling Alliance is not enough to give a full picture of the man and I have a feeling I have a lot more to learn about him. Popham was clearly an intelligent and inventive officer whose achievements are quite remarkable. His work on naval communications was ahead of his time, his work at the Admiralty on the chart committee helped establish the excellent reputation of Admiralty charts. He was a scientific officer with a considerable talent for organisation and often worked better with the army than with the navy. He was a good captain, a loving husband and an affectionate father. And yet there is always something else about Sir Home Riggs Popham. Suspicion and accusation dogged his entire career. Some of his exploits are extraordinary but I have the sense that he must always have been looking over his shoulder, waiting for his past to catch up with him. He received high praise for many of his achievements, but he does not seem to have been generally liked. It is difficult to know whether Popham’s reputation as a “damned cunning fellow” is based on his actions or simply on a difficult personality. His achievements are remarkable but in an age when the ideal of a naval officer was Horatio Nelson, a scientist and surveyor who specialised in joint operations with the army was unlikely to become a national hero and it is ironic that some of Popham’s finest moments seem to have involved the evacuation of troops from difficult situations. Whatever the truth of it, Sir Home Riggs Popham – elusive, enigmatic and controversial – is a gift to any historical novelist and I am looking forward to revisiting him during the Walcheren campaign. An Unwilling Alliance is a novel of the 1807 Copenhagen campaign, available on kindle and in paperback at Amazon. My next book, This Blighted Expedition, following the Walcheren campaign, will be published later this year. Paul had been in Dublin with five companies of the 110th when he had received his promotion to major and with it the news that he would take command of the first battalion under Sir Arthur Wellesley in Denmark. 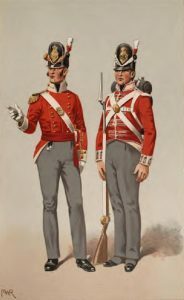 The promotion had come at a relatively young age and he had leapfrogged a number of older and longer serving captains in the regiment. The commander of the second battalion, Major Middleton was in his fifties and considering retirement but there were several men who could have claimed Paul’s promotion as their due. Paul was trying hard not to feel defensive about his good fortune, but he was under no illusions that the main factor in his success had been financial. 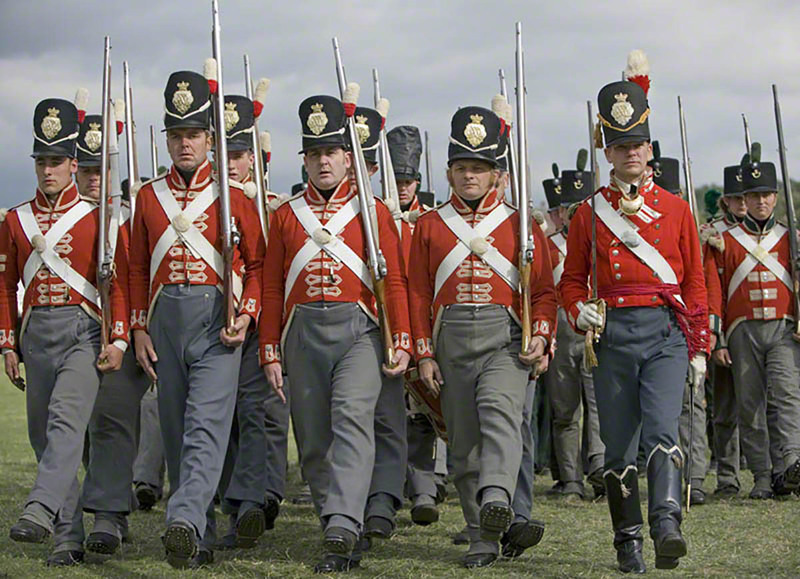 Under the traditional system, promotion was offered to the next man in line in the regiment. If none were able to come up with the purchase price, the commission could be sold to an officer from another regiment wanting to transfer for promotion. The Duke of York, who had made admirable attempts to reform some of the abuses of the system, had put in place length of service conditions for promotion to captain and major which were effective in peacetime although might be relaxed during campaigns when officers were in short supply. Paul had barely reached the required number of years when the promotion had been offered and in his battalion alone, at least four other captains had served longer; more if the second battalion were taken into account. Money had made the difference. Paul’s mother had been the daughter of a viscount but his father was from a trade background and had made his fortune in shipping and finance many times over. When the elderly Colonel Dixon had decided to retire, his commission was sold to Major Johnstone who was in command of the first battalion. Paul, puzzled by Wellesley’s conviction that the majority was his if he was willing to pay for it, had quickly realised that the colonel was expecting his retirement to be funded by a premium on the sale of his colonelcy, a premium which Johnstone could only afford if he added the sum onto the sale of his own commission. The premium was strictly against regulations but Paul was aware that they were an open secret in fashionable regiments, where commissions were sometimes sold for twice the regulation price set by the government. He was both irritated and amused at the approach by the regimental agent, with Dixon and Johnstone remaining at a discreet distance as if the negotiations might sully their hands. Commissions in the 110th did not generally command much of a premium; it was a relatively new regiment with no history and little reputation thus far, but Colonel Dixon was very well aware of both the personal fortune and the ambition of his most unlikely company officer and had taken the gamble. Grimly aware that he was about to be fleeced, Paul had gone back to his mentor, Sir Arthur Wellesley who was in London on Parliamentary business and invited him to dine at the Van Daans’ London home. Paul’s father and brother were away in Leicestershire and they had dined privately and sat afterwards over a good port. “Have you received your commission, Major?” Wellesley had said. They had talked, during dinner, of neutral matters; of the current situation in India and the proposed expedition to Denmark. They had also spoken of politics and the latest London scandals. Paul had been waiting to see if his chief would raise the subject. Clearly something had ticked Surgeon Dalzell off beyond the telling and if there was a man on that court martial with a straight face by that point, he was a better man than I am. A brief search has revealed that to threaten to “pull a man’s nose” was considered an insult likely to lead to a duel in the ante-bellum South and when I need another distraction I am going to download that article in full as I want to find out the origin of that one. Certainly it is clear that Surgeon Dalzell and Major Mansergh were not going to be exchanging Christmas gifts. Now there is clearly a bit of a theme here, and it looks as though the court was able to spot it. Surgeon Dalzell, interestingly was acquitted of the charges of nose-threatening and general name-calling. The court made mention of something that Mansergh said about the surgeon in a conversation with Captain Davis that evening in the barrack yard which had caused Dalzell to lose his temper. Although he was acquitted, he was instructed to make an apology to Major Mansergh for improper language and conduct. The wording of the apology is very specific – I’m guessing all Dalzell had to do was read it out and the matter was over. Clearly the court felt that whatever had happened, Dalzell was provoked. Captain Davis wasn’t quite so lucky and I wonder if that was because of his rank. Certainly given that he went for his commanding officer in front of the enlisted men on the parade ground, he was very unlikely to get away with it. Captain Davis was found guilty and suspended without rank or pay for the term of two years. Even so, the court expressed some sympathy for Davis, pointing out that his treatment by Mansergh, while it can’t justify his actions, certainly mitigated his sentence. Presumably without it, he might have been cashiered. The editor has very kindly provided footnotes of what happened to the principals in the various cases and that’s where it becomes interesting. Captain Davis sold out the following month, presumably unable or unwilling to live without pay or rank for the next two years. Surgeon Dalzell must have taken his medicine and made his stilted apology to Major Mansergh because he remained in the army and was appointed Surgeon to the Forces in Ireland in 1804. Clearly he managed to control his temper better in the future. The book containing these fascinating stories is A Collection of the Charges, Opinions and Sentences of General Courts Martial as published by authority by Charles James (published in 1820). It’s frustrating not knowing the stories behind some of these trials but what is interesting to me is a novelist is the outcomes of many of them. Until I started looking in to military discipline in more detail, I think I had assumed that a court martial was seen as a disgrace and the end of an officer’s career but clearly that is not the case. In both the army and the navy, officers were court-martialled, acquitted or received minor punishments and went on to do very well. Captain Bligh of the Bounty survived no less than three courts martial during his career. Court martial seems to have been a valid way of seeking an enquiry into an incident. An officer censured for some error would often ask for a court martial to clear his name; a good example of this would be Lt-Colonel Charles Bevan after the fiasco at Almeida in 1811 whose request for a court martial was denied, a fact which contributed to his suicide. The other fact about a court martial which came as a surprise to me was that the King looked at all trial records and had the right to override either the verdict or the punishment. I was aware through research into the Peninsular War that the commander-in-chief had the right to commute sentences on men convicted of local offences but it appears that it was not uncommon for the King to completely overturn the decision of the General Court Martial, either in deciding to declare a verdict of not guilty, or simply to announce that he no longer required the services of the officers involved. In matters of military discipline in the 18th and 19th century there must always have been a lot of leeway depending on individual circumstances. An officer committing an offence needed to be charged by a senior officer and there must have been many occasions where a good officer got away with an informal reprimand simply because he was good at his job and valued. Equally there would have been senior officers with a bee in their bonnet about particular issues for example Admiral Gambier was known to be an evangelical Christian and used to fine his officers for bad language. Commanders confident in their relationships with their officers will have used different methods of management, saving court martial for extreme cases in the same way that a good manager rarely uses the formal disciplinary process. There are always variations from the strict letter of the law. 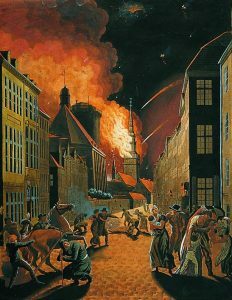 The bombardment of Copenhagen in 1807 occurred when Britain carried out an attack on a neutral country in order to either destroy or capture its fleet to prevent it falling into the hands of the French. This little known action of the Napoleonic Wars was seen by many as a stain on the British character although the government remained steadfast in its belief that the attack was an unpleasant necessity. In 1806 Napoleon launched his Continental System which was designed to paralyse Great Britain through the destruction of British commerce. The decrees of Berlin in 1806 and Milan in 1807 proclaimed a blockade: neutrals and French allies were not to trade with the British. The Continental System damaged some English industries, but as the British had an overwhelming superiority at sea, enforcing the system proved too difficult for Napoleon. His efforts to police his blockade stretched French forces too thin, and he was never truly able to make it work. Britain’s first response to the Continental System was to launch a major naval attack on the weakest link in Napoleon’s coalition, Denmark. Although ostensibly neutral, Denmark was under heavy French and Russian pressure to surrender its fleet to Napoleon. Despite the defeat and loss of many ships in the first Battle of Copenhagen in 1801, Denmark-Norway still maintained an impressive navy. Most of the Danish army was at this time defending the southern border against possible attack from the French. There was concern in Britain that Napoleon might try to force Denmark to close the Baltic Sea to British ships, perhaps by invading Zealand. The British believed that access to the Baltic was vitally important to Britain for trade, raw materials for building and maintaining warships and Royal Navy access to Britain’s allies Sweden and originally Russia against France. The British thought that when Prussia was defeated, Denmark’s independence looked increasingly under threat from France and had previously tried unsuccessfully to persuade Denmark into a secret alliance with Britain and Sweden. On 21 January 1807, Lord Hawkesbury told the House of Lords that he had received information from someone on the Continent “that there were secret engagements in the Treaty of Tilsit to employ the navies of Denmark and Portugal against this country”. He refused to publish the source because he said it would endanger lives. The reports of French diplomats and merchants in northern Europe made the British government uneasy, and by mid-July the British were convinced that the French intended to invade Holstein in order to use Denmark against Britain. After a wealth of diplomatic to-ing and fro-ing, Canning received intelligence from Tilsit that Napoleon had tried to persuade Alexander I of Russia to form a maritime league with Denmark and Portugal against Britain. Spencer Percival, the Chancellor of the Exchequer wrote a memorandum setting out the case for sending forces to Copenhagen. With some reluctance, the King agreed. The British assembled a force of 25,000 troops and Canning offered Denmark a treaty of alliance and mutual defence, with a convention signed for the return of the fleet after the war, the protection of 21 British warships and a subsidy for how many soldiers Denmark kept standing. On 31 July, Napoleon told Denmark to prepare for war against Britain or else France would invade Holstein. Neither France nor the British persuaded the Danes to end their neutrality, so the British published a proclamation demanding the deposit of the Danish fleet; the Danes responded with what amounted to a declaration of war. The Danish forces in the city amounted to 5,000 regular troops and a similar number of militia. 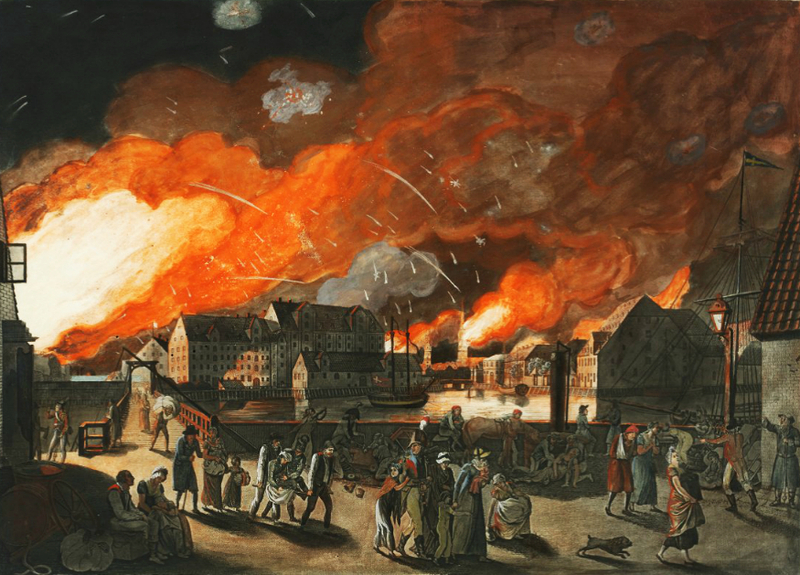 Most of the civilian inhabitants of Copenhagen were evacuated in the few days before Copenhagen was completely invested. 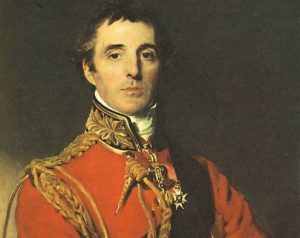 On 26 August, General Sir Arthur Wellesley was detached with his reserve and two light brigades of British artillery, as well as one battalion, eight squadrons and one troop of horse artillery from the King’s German Legion to disperse a force which had been sent to relieve the beleaguered city. On 29 August, at Koge the British force overpowered the Danish troops, which amounted to only three or four regular battalions and some cavalry. 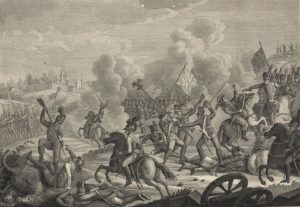 The Danes rejected British demands, so Lord Cathcart gave the order for the British army batteries assisted by the fleet under Admiral Gambier to bombard the city from 2 to 5 September 1807. In addition to the military casualties, the British bombardment of Copenhagen killed some 195 civilians and injured 768. The bombardment included 300 of Congreve’s rockets which caused fires. Due to the civilian evacuation, the normal firefighting arrangements broke down and over a thousand buildings were burned. On 5 September, the Danes sued for peace, and the capitulation was signed on 7 September. Denmark agreed to surrender its navy and its naval stores. In return, the British undertook to leave Copenhagen within six weeks. On 7 September 1807 Peymann surrendered the fleet which was either captured or destroyed to stop it falling into the hands of the French. On 21 October 1807, the British fleet left Copenhagen for the United Kingdom but Denmark remained at war with them until 1814. There were attacks in Parliament on the government’s decision to invade and bombard a neutral country but Canning remained convinced that he had made the right decision. An Unwilling Alliance, published in April 2018 was a new venture for me in several ways. It is the first book which is partly set on the Isle of Man where I live, and Captain Hugh Kelly and Roseen Crellin are both Manx. I have been asked fairly frequently if I intend to write a book with a Manx setting. I wanted to do so but since the Napoleonic wars were a long way from Mann, the obvious setting was the navy since many Manxmen served with great distinction, most notably Captain John Quilliam RN who was first lieutenant aboard the Victory during Trafalgar. Writing about the army has become second nature to me; the navy took some work but I loved writing it and am currently working on Hugh Kelly’s next adventure which will take him, along with the second battalion of the 110th, on the disastrous expedition to Walcheren in 1809. The other joy of An Unwilling Alliance was that it gave me an opportunity to combine both the army and the navy. Joint operations were very common then as now and a lot more difficult given the limited communications of the day. Officers and men on both sides had a tendency to assume that their branch of the armed forces was the best and jokes were common but there was genuine resentment in some cases. 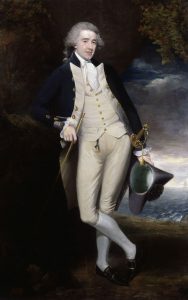 If a joint operation went wrong each side often blamed the other as a matter of course; poor John Pitt, Earl of Chatham definitely came in for some of this after the disastrous Walcheren campaign in 1809 where blame could probably have been shared between the army, the navy, the planners of the operation and sheer bad luck. I have given myself the challenge of trying to convey some of this feeling at Copenhagen, where at least one of the army commanders, Sir Arthur Wellesley, would have done things very differently had he been given the choice. And then there is genuine cooperation and the beginnings of friendship between Captain Hugh Kelly, my down-to-earth, plain-speaking Manxman and the flamboyant, newly-promoted commander of the first battalion of the 110th, Major Paul van Daan. Finally, an Unwilling Alliance gave me the opportunity to go back in time from Wellington’s Peninsular Wars where the 110th had been fighting for the last four books and take a look at an earlier episode in Paul’s history which was briefly referred to, but not described, in An Unconventional Officer. It was an odd experience to look back at a younger Paul and remember all the lessons he hadn’t yet learned in 1807 and it also reminded me somewhat painfully why keeping detailed character lists is so important when writing a historical series. 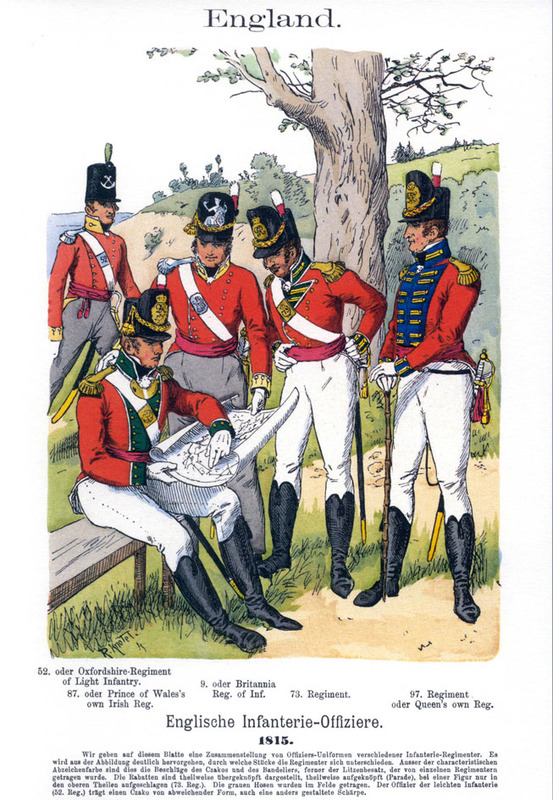 In terms of historical sequence, An Unwilling Alliance fits in at the end of chapter seven of An Unconventional Officer, when Paul has just been promoted to major and given the news that the battalion is being posted to Denmark under Sir Arthur Wellesley. Paul is twenty-five and still has a lot to learn about how to manage the army, his temper, his love life and his unemotional commander. Captain Hugh Kelly is thirty and started out life as a farmer’s son on the Isle of Man; he came up the hard way and has a lot of experience that Paul still lacks. Watching them get to know each other was a genuine pleasure and I hope they have the chance to meet up again in the future. 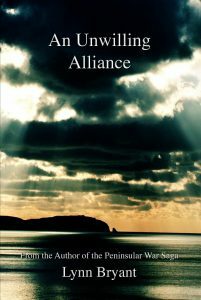 An Unwilling Alliance was published in April 2018 – you can read an excerpt here. My next book, which is centred around the Walcheren expedition, is titled This Blighted Expedition and will be published later this year. The Historic Dockyard at Portsmouth is more than just a museum. 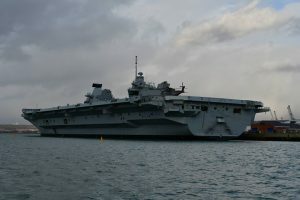 It is a site containing a collection of museums, all of them connected to the Royal Navy and Britain’s maritime heritage and you need more than one day to do all of them. Since we only had one day and since the aim of my visit was to soak up some background information about naval warfare and life in the 19th century navy, I was very specific about the museums we chose but we had time for one or two extras and I will definitely be back to do the rest. This place is absolutely brilliant. 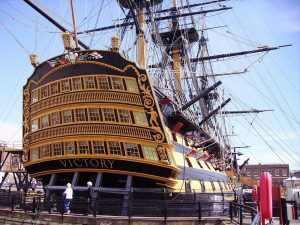 We went first to visit HMS Victory, the flagship of Admiral Lord Nelson at the battle of Trafalgar. She is looking a little odd at the moment since a new phase of restoration and conservation is taking place, and the top half of her masts is missing. Despite that, there is no way that this ship can look anything other than impressive and beautiful. HMS Victory left the Chatham Royal Dockyard in 1765. Over an unusually long time in service she would lead fleets in the American War of Independence, the French Revolutionary War and the Napoleonic War and in 1805 she achieved lasting glory as the flagship of Vice-Admiral Nelson at Trafalgar when Britain defeated the French and Spanish fleet in what is often seen as Britain’s greatest naval victory. In 1808 the Victory was re-commissioned to lead the fleet in the Baltic. Four years later, no longer required in this role she was relegated to harbour service as a residence, flagship and tender. 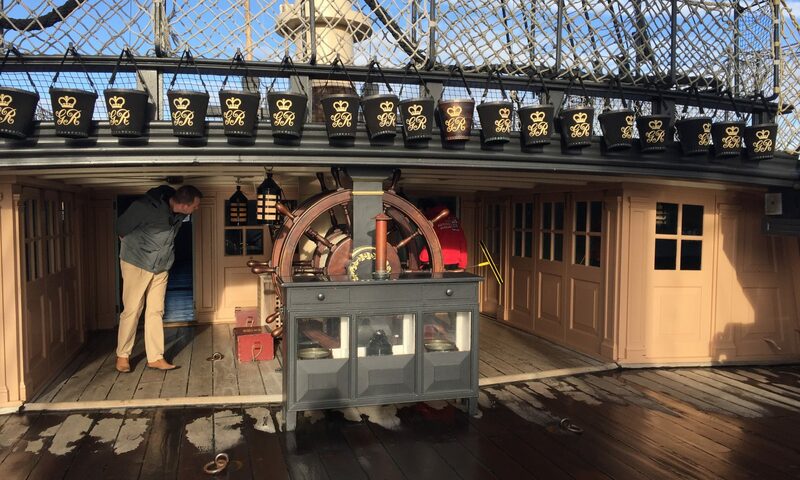 In 1922 she was saved for the nation and placed permanently into dry dock where she is today visited by millions of visitors from around the world; a museum of the sailing navy and the oldest commissioned warship in the world. For me, the Victory was a chance to step aboard a warship of the age. My current work-in-progress, An Unwilling Alliance, is about a Manx sea captain who survived Trafalgar and has just been given command of his own warship. The Iris, Hugh’s ship, is not as big as the Victory, being a third rate 74 gun ship, but there is still a strong sense of what life might have been like aboard such a ship and the task of writing about the Iris and its crew suddenly feels more manageable. The Victory is set up to give a very good sense of life aboard a warship. Sections of the lower deck have hammocks set up and some of the tiny officers and midshipmen’s cabins are furnished as they would have been at the time. You can see the captain and admiral’s quarters and it is fascinating to see how the crew slept and lived alongside the guns. With a battle approaching, furniture would be cleared away and the entire area would become a battleground. Naval battles at this time were not just about the pounding of heavy guns. Ships fought close together and sailors and marines fired muskets and pistols at the enemy crew as if in a land battle. Nelson’s fatal wound at Trafalgar was caused by a shot down from the enemy rigging which shattered his spine. Once ships were close together the aim was to board the enemy ship and close and savage hand to hand fighting with sword, bayonet and axe would ensue. 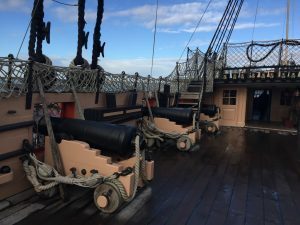 The ship’s guns did not fire exploding shells, they acted as battering rams, smashing the enemy ship to pieces, and a lot of the wounds treated by the ship’s surgeon came from wooden splinters which could be lethal. One of the big assets of this museum are its guides. Most are volunteers, often former navy personnel and their knowledge and enthusiasm for their subject is very impressive. These are not people who have done a bit of background reading on the subject; they know it all. We spent a fair bit of time chatting, not just about the Victory and the Napoleonic wars but about other ships and other combats. It would be easy to spend a day just talking to them. If there is a downside to the Victory, it is the lack of written information. There is a guidebook and an audio-guide. I’m not a fan of either as I find wandering around with a book in my hand or listening through headphones detracts from the experience for me, so initially I found the complete absence of any kind of information boards irritating. I quickly realised that there was always a guide close by to ask, and they always know the answer, but if you’re not one to start talking freely to complete strangers, make sure you get a guide of some kind before you board or you’ll miss out. The other thing to be aware of, is how low the lower decks are. We were told that some of the warrant officers were six feet or more and it must have been an enormous strain working below decks at that height. At 5’6” I had to stoop a fair bit and my 6’ husband had a backache by the end of the tour. Having said that, it was a completely brilliant experience and I would recommend it to anybody. There is a lot of this, it needs plenty of time. 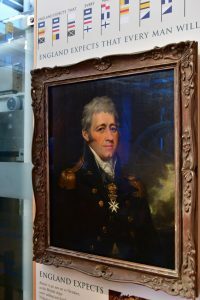 The museum is in two parts, one dedicated primarily to Nelson and his war and the rest covering the history of the Royal Navy up to modern times, including a fabulous exhibition about women and their role in the navy, especially the history of the WRENs. It’s a great museum, well-set out with a huge amount of information and something for everybody. We had to rush some parts of it, so be warned and give it time. This was my bonus treat of the day. Completely out of my period, but the skeletal remains of Henry VIII’s flagship, raised from the Solent and preserved along with many artifacts, is one of the most haunting sights I have ever seen. The museum is very new and combines the history of the ship and its sinking with the story of its recovery very effectively. The technology used to display the ghostly hulk of the Mary Rose, with images of its daily life projected onto it, is impressive. I can remember following this story as a history student back in the eighties and what they’ve done since then defies belief. Along with the Victory, this has to be the highlight of the Dockyard and is one of the most incredible things I’ve ever seen, so atmospheric. Go and see it. The Mary Rose was the end of our day. I plan to come back and spend a few days in Portsmouth. I want to see the rest of the historic dockyard: there is a lot more to see, including the Victorian HMS Warrior, the Submarine Museum, HMS M.33 and several other attractions that I didn’t have time to explore. This would be an excellent place to visit with children, they have their own dedicated play areas but the exhibits themselves are very much designed for all ages. 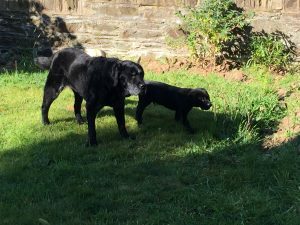 Mine are older now but they would have loved this place. I would also like to spend time looking at the town itself. I definitely got what I came for, but I want more. I’ve been worried about taking on the mammoth task of writing about the navy in 1807 when I feel so much more comfortable with the army, but Portsmouth Historic dockyard is a big step forward for me. 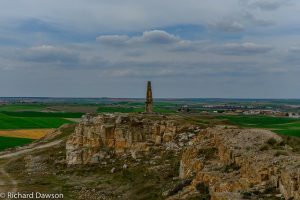 After months of reading and making notes I suddenly feel that I’ve got a sense of my locations in the same way I did when I stood on the walls of Ciudad Rodrigo in Spain. Writing the navy is very different; although they lived and loved on shore, when they went to work they did it in a small space, bound by wooden walls but with the ocean all around them. That must have shaped the character of the men who fought and died with Nelson and I’m looking forward to getting to know some of them better. An Unwilling Alliance is due for publication in April 2018.